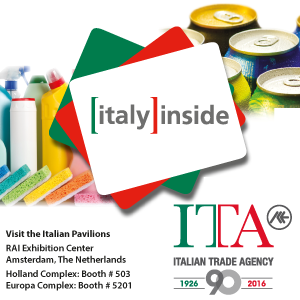 To view the profiles of Italian participants at previous editions, please select the year from the list below. PLMA's 2016 "World of Private Label" International Trade Show will present more than 2.370 exhibit stands including 70 national and regional pavilions, on a total surface of 37.845 square metres. Products on display will include fresh, frozen and refrigerated foods, dry grocery and beverages as well as non-food categories, including cosmetics, health and beauty, household and kitchen, auto aftercare and housewares & DIY. PLMA's 2016 show will be held 24-25 May and attract buyers from world's supermarkets, hypermarkets, discounters, department stores, drugstores, wholesalers, importers and exporters. Around 12.000 the visitors attended. Make plans now to exhibit or attend.